When the ice thaws on Oeschinensee each spring, a sparkling turquoise lake appears, reflecting the surrounding mountains on its surface. The breathtaking scene is tucked away in the Bernese Alps of Switzerland, a cable-car ride above the small, timbered town of Kandersteg. People come here for the mountain hikes and gorgeous blue waters in summer, and for the family-friendly ski runs and ice walks in winter. But with so much to explore 5,000-plus feet up in the air, you’ll want to plan ahead to make sure you don’t miss anything. Keep reading for how to make the most of your time at Lake Oeschinen and tips on when to go, where to stay and how to get there. This post contains affiliate links, which means that if you click on or buy something, we might receive a commission for telling you about it, at no extra cost to you. As an Amazon Associate I earn from qualifying purchases. Besides making friends with the cows living their best life on the shores of the lake, there is tons of outdoorsy stuff to do at Oeschinensee, whether you come for a couple of hours or a full day. If you have 2-3 hours, take the cable car up to the top and walk to the lake (about 30 minutes each way). With a short visit, you can either rent a rowboat for an hour, walk along the shoreline snapping pics of the waterfalls or kick back at the lakeside restaurant with a coffee. Back at the upper cable car station, a twisty toboggan sleigh run at the edge of the mountain is open in summer. If you have 4-6 hours, you can either hike up from Kandersteg to Oeschinensee (about 90 minutes) or ride the cable car and tackle the 3-hour Heuberg loop trail above the lake instead. After working up a sweat, why not jump into the water for a swim before grabbing a picnic lunch from the lakefront restaurant. If you have a full day, you’ll have enough time for a longer Oeschinensee hike up to a mountain hut with elevated views of the lake. The Frundenhutte trail, for example, takes about 3 hours one way and leads to a station with a little cafe at about an 8,400-foot elevation. You can guzzle some soup and fruit cake up here before heading back down (or stay overnight with a reservation). 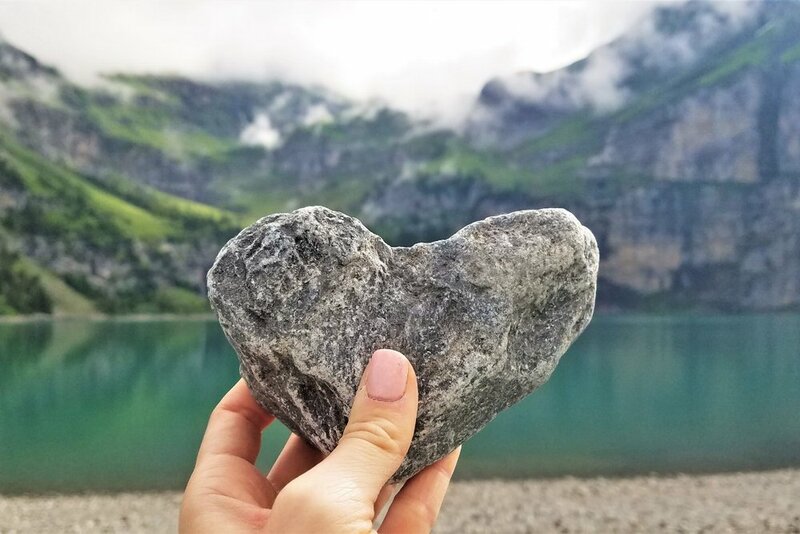 If you’d prefer to spend the day down at the lake, you’ll have time for things like fishing (you’ll need to secure a license and gear down in Kandersteg), grilling at the lakeside barbecue pits (the restaurant shop has supplies), or just kicking back with a good book while you listen to cowbells jingling in the background. If you’re visiting in winter, activities change to the snowy variety when the lifts reopen in December (they typically close in October). Ski school for kids and ski runs for pros crisscross the mountainous terrain, and the steep slope between the gondola stations becomes a 2-mile-long sledding path. When the lake freezes over, you’ll be able to ice-fish in designated areas, and walk an icy loop across the lake, too. When should I go to Oeschinen Lake? Summer and winter are the best times to visit, as the gondola and restaurants shut down during early spring and late fall. Wait until the snow melts for a warm season visit to take advantage of hiking and swimming under the sun. The winter activities typically start around Christmas. How do I get to Oeschinensee? Oeschinen Lake is located in the mountains above Kandersteg. If you’re coming from the north in Bern, you can grab a train ride that skirts Lake Thun or drive about 40 miles down the A6 highway. From Zermatt in the south it’s about the same distance, but the journey takes a bit longer as cars have to load onto a transport train and cross through the Lötschberg Tunnel to Kandersteg. From Zurich, it’s a little more than 2 hours here by car or train, with a particularly scenic driving route through the middle of the country passing by the lakes of Lucerne and Interlaken. From Kandersteg, you can either hike up the mountain or pay for a cable car ride to the top (check current prices here). The walk to the lake from the gondola drop off takes about 30 minutes but is a fairly easy stroll along flower-filled meadows where herds of cows like to hang out (and sometimes block the road). Just be sure to grab a map from the station before you take off as there are a few different trails at the top. Where should I stay near Oeschinensee? If you want to spend the night near Oeschinensee, you have a couple of location options. 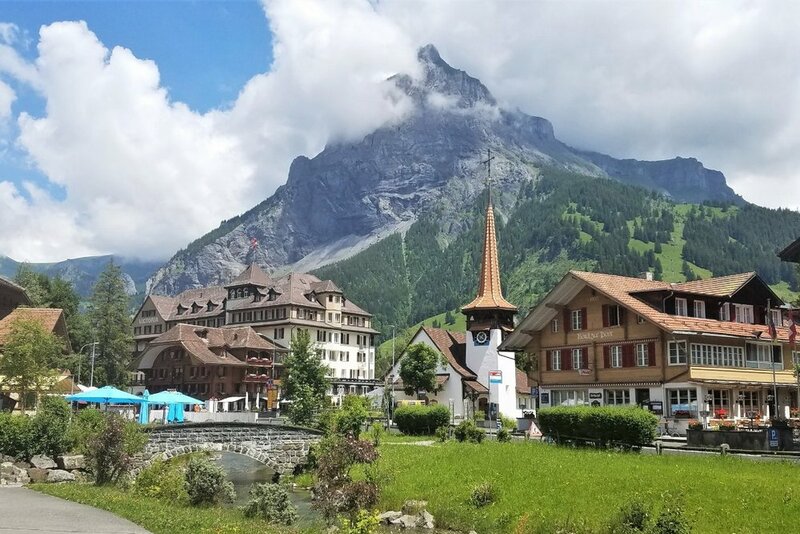 You can either stay at the top of the gondola lift at one of the lakeside hotels or mountain huts, or you can opt for a Kandersteg hotel in the town below. The family-run Berghotel and Berghaus guest houses have single, double and multi-bed rooms right on the lake with restaurants attached to the properties. If you’re willing to hike to them, a few small lodges with overnight accommodations are buried in the mountains. Frundenhutte is about a 3-hour hike from the upper gondola station on the south side of the lake, and Doldenhornhuette takes about 3 hours from Kandersteg. You’ll find a couple dozen chalets, hotels and guest houses along the charming streets of Kandersteg. Many have small restaurants attached, too. We stayed in the historic Simplon House, a 100-year-old property with cozy, wood-paneled rooms and dorms. Michelle created Harbors & Havens to share her wanderlust and inspire others to travel more. She is a freelance writer based in Houston.